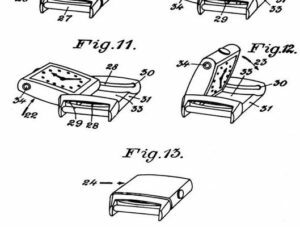 Many watches trace their roots to functionality over form before eventually evolving into elaborate, expensive timepieces. Likewise, many watches also have roots in sport. 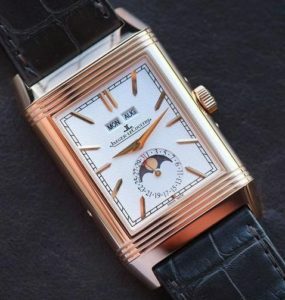 The Reverso is no different. 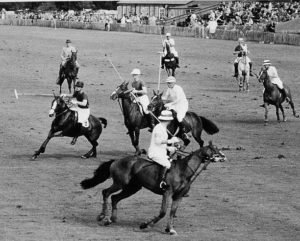 First introduced in 1931, this watch was made specifically for British Army officers playing polo in India. The officers needed something that would tell them the time, yet also would hold up to the constant bobbing, swinging and other movements associated with riding on horseback and playing the sport. César de Trey, on a trip to India, saw how the players’ watches could not always stand up to the test of competition, especially the crystals. 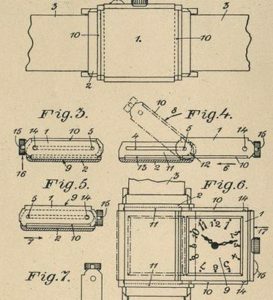 Upon his return home, de Trey passed on his idea to his watchmaker friends, who then created a watch “which can slide on its base and flip over on itself,” thus protecting itself from the elements of nature or sport. 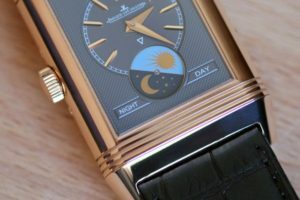 The Jaeger-LeCoultre-made watch has the ability to reverse — hence its name — its face to protect the crystal from damage, instead showing the watch’s back. 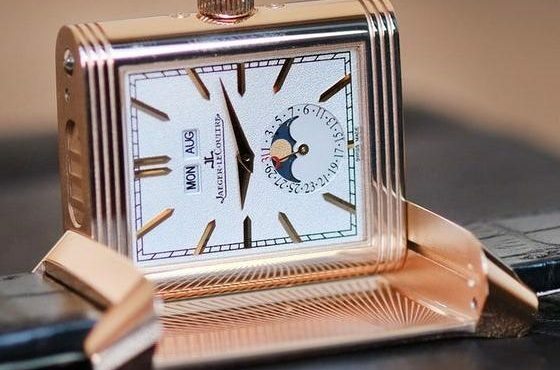 The watch, with its Art Deco design, was popular but fell out of favor after World War II after the Art Deco era came to a close and production fully stopped in the mid-1970s before being revived a few years later. 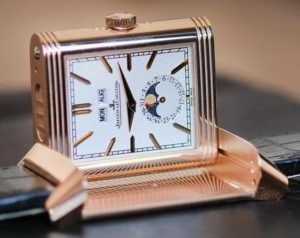 The Reverso celebrated its 85th anniversary in 2016. 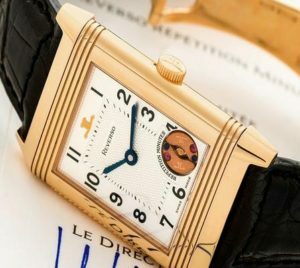 During its run, the Reverso has been a choice for world dignitaries fashion trendsetters, partly for its unisex offering. The back of the case, which is flipped to face forward when protecting the crystal, is also a spot which can be engraved with a name, date or anything else to memorialize a moment. Mark…Ive been meaning to tell you for months how much I enjoy your informative Watch revelations like this Jaeger one…& I appreciate that you take the time to give us all such a lot of pleasure ! I also agree with what Chris K said. I appreciate you taking time to do this. Great idea to protect that watch. Love the emails- about rare and interesting watches – thank you Mark !! Always great stories and explanations. Thank you Mark! Mark…I enjoy these stories! 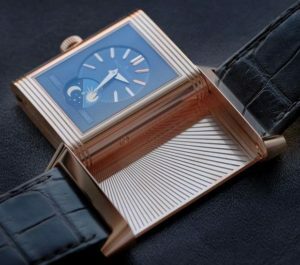 I never knew of this Reverso watch but I needed one during my old rodeo days! Hope this finds you well & doing the fabulous work you do! Thank you for the interesting stories all are very good. Thanks Mark! 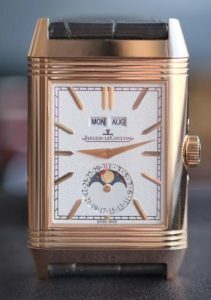 I’ve admired the Reverso for years but never knew the purpose of its origin! Bits of watch history we never knew we had a need to Know until Mark gave them to us! Omega made one, too. Flips the same way. It has quartz movements; digital on one side and analog on the other. Very nice. I have one but it doesn’t run. But it is still nice to look at. Excellent article! !…….on the top of my wish list!! I’ve always admired these Art Deco classics, but was not aware of the history behind them. If they ever build one in a larger case I might buy one.